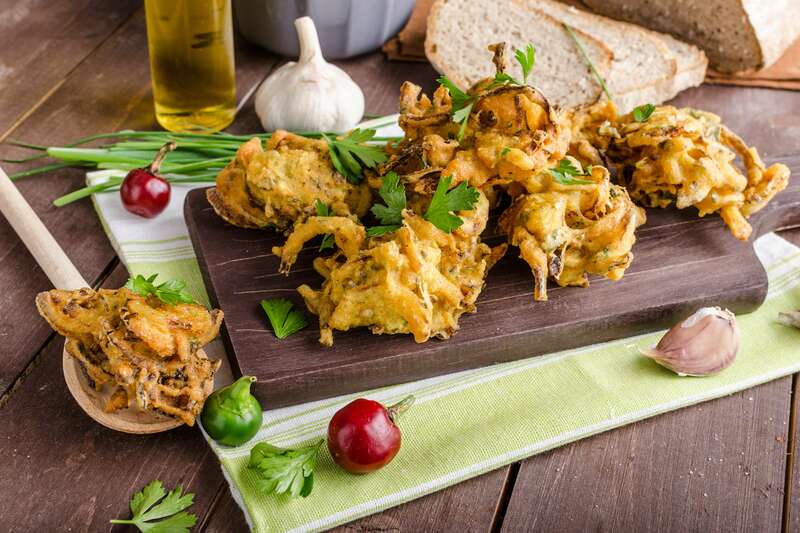 RecipeSavants.com These delicate onion bhajis, or onion pakora are inspired from Indian cuisine, and they feature a a complex blend of flours and spices. If you can not find the Garbanzo Bean flour (Besan) at your local grocery store, try an Indian grocery or find easily online. Smart Recipes, Indian Recipes, Eggs,Grains Recipes, Recipes Eggs,Grains Indian Onion Bhajis PT30M Serves 4 Ingredients: 1 Cup Cold Water 0.25 Cup Fresh Cilantro Leaves 0.25 Teaspoon Ground Cayenne Pepper 0.75 Cup All Purpose Flour 0.75 Cup Whole Wheat Flour 1.5 Cups Organic Chickpea Flour 0.5 Teaspoon Ground Cumin 0.5 Teaspoon Salt 2 Medium Onions 1 Medium Egg 2 Cups Vegetable Oil 1 Cup Homemade Punjabi Green Chutney 1 Cup Homemade Raita In a bowl, combine flours, beaten egg, and just enough water (add it 1/4 cup at a time) until a thick batter is formed. Stir in the salt, cayenne pepper, cumin, and cilantro, beat until well combined. Rest for 15 minutes. Stir in the sliced onions, and rest for another 5 minutes. In a cast iron skillet, heat oil over medium-high heat to about 350 (use a candy thermometer for accuracy). Pour a small amount of the batter, about 2 tablespoons, into the hot oil and press down with the back of spatula. Fry until crispy and golden brown. Transfer to a paper towel-lined plate to drain. Serve with mint-cilantro chutney or raita.